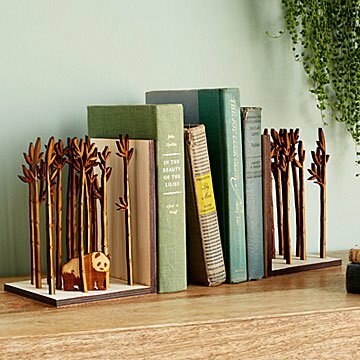 A shy panda watches over your favorite stories when you nestle them in Stephen Truong’s bamboo bookends. A panda eats between 20 and 40 pounds of bamboo every day. Fortunately, the little fella hiding among Steven Truong's handmade stalks is more interested in reading than eating. To craft each pair of bookends, Steven mimics the dimensions of an actual bamboo field, capturing the towering plants' ridged stems and curving leaves in baltic birch plywood. He then places an adorable wooden panda in the grass, making the set a delightful gift for book and animal lovers alike. Handmade in Texas. By day, Steven Truong is an electrical engineer, working with spreadsheets and program codes. But by night, he creates miniature worlds, working with wood to build intricate, three-dimensional displays. Most of his stunning designs begin as photo art. He takes pictures of people, nature, and animals, and mimics the precise characteristics of their dimension and shape. He then laser cuts birch plywood into detailed shapes, creating enchanted scenes that make for unique decor or stand-alone mini installations in your home. Steven crunches numbers and crafts his art in Dallas, Texas.